The Ottawa Catholic School Board (OCSB) was selected to participate in CEA’s Innovation that Sticks case study research program and received a $10,000 contribution courtesy of State Farm Canada to support their ongoing innovation. OCSB representatives shared lessons learned along their journey to success for a case study report, which also contains key observations and recommendations for other education leaders trying to grow their own innovations from classrooms to entire schools and school districts. 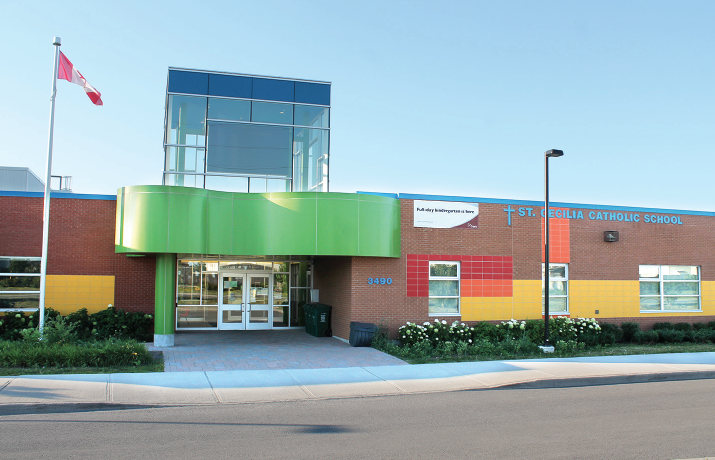 The front entrance of Ottawa’s St. Cecilia Elementary School, with its brightly coloured façade and curvilinear canopy, is designed to evoke excitement and anticipation. Soaring above the canopy, a glass tower symbolizes our love of learning and our motivation to bring “the Light of the World” into our school and community. Today’s students are different from the students that our system was created to educate. The new digital learners are immersed in technology and they expect to use digital tools as part of their educational experience. Brain-based research provides evidence that today’s generation of students are “wired” differently than previous generations. Instructional strategies are evolving to reflect the needs of 21stcentury learners. The Board was creating a digital ecosystem to reflect the changing global environment; it also happened to be planning to open a new elementary school. Board educators had a vision for a facility designed to enhance the acquisition of global competencies. Before we could invite bids from architects, we needed to clarify our own vision and “wish list.” Board staff started the process: The design had to facilitate teaching and learning through collaboration and instructional differentiation. The design challenge was to create a model that would allow all spaces to be “places of learning.” (Today this concept has evolved into creating “agile” learning spaces.) Utilizing the talents and creativity of our own staff created opportunities for leadership and invited the risk taking necessary for innovation. A Family of Schools Superintendent with responsibilities for Special Education and Student Services was assigned as the chair of the Elementary School Design Committee. The Superintendent of Planning and Facilities and the Superintendent of Learning Technologies were a resource to the committee. In addition to the three superintendents, the committee included several elementary principals, and representation from Special Education, Learning Technology, Planning and Facilities, and Elementary Student Success, as well as teaching consultants representing Early Learning Services, Literacy and Numeracy. The first email sent to the committee members stated, “Congratulations – you have won the lottery! And the prize is membership on the Elementary School Design Committee – to look at school design from a perspective of 21st century teaching and learning, leveraged by technology and student engagement.” Input was also solicited from student and parent focus groups and interviews with the principals from the last two elementary schools that had been opened in the previous five years. Overall school space is determined by Ministry regulations where benchmark limits are established for the size and cost of the school based on the number of pupils to be accommodated. Any changes to total school space configuration must be made within the existing maximum square footage. New design may not result in cost above the benchmark funding allocation. Funding is pre-determined by Ministry formula. Blackboards are now replaced by interactive boards in new schools. Use of hallways as learning spaces must incorporate compliance with building codes to ensure access to exits. Additional electrical outlets in floors and walls are required to support increased use of technology in all new designs. Modular furniture that can be combined and recombined in a variety of modalities is required to facilitate instructional differentiation and flexibility in the structure of the classroom. The functionality and design of space must reflect the need for supervision and classroom management of children three to 12 years of age. Computer labs are no longer included in new designs as computers are now accessible for various groupings within classrooms. Sound amplification systems to enhance hearing and aid learning are to be available in each classroom. All recommendations from the committee went to the senior executive team, where the ideas were tested for compatibility with student engagement and learning outcome enhancement. The Associate Director of Education and the Director of Education were both very involved to ensure that pedagogy would drive the design of physical space. Bryden Martel Architects Inc. (Ottawa) was awarded the contract for architectural services for the St. Cecilia facility, to be located in a growing suburb of Ottawa. The construction budget for the building was set at $8.4 million dollars, consistent with previous projects. The school was designed to accommodate 507 JK-6 pupils, with a footprint of approximately 50,000 sq. feet. The opening date was set for September 3, 2013. The final design was supported and approved by the School Board of Trustees and by the Ministry of Education, who provided the funding for the new school. Three years after the launch, a visitor to St. Cecilia will see students and staff engaged in inquiry learning, both inside and outside of the classroom. Learning Commons: The old library was turned on its head in favour of an open Learning Commons that combines traditional reading material with various technologies. While the school is generally rectilinear in form, the Learning Commons echoes the curvilinear shape of the entrance canopy. The contours in the plan are repeated in the patterning of the multi-layered ceiling to excite and delight the eye. The organic form of this space provides many areas for differentiated work. There are spaces for individual and group work as well as noisy and quiet activities. 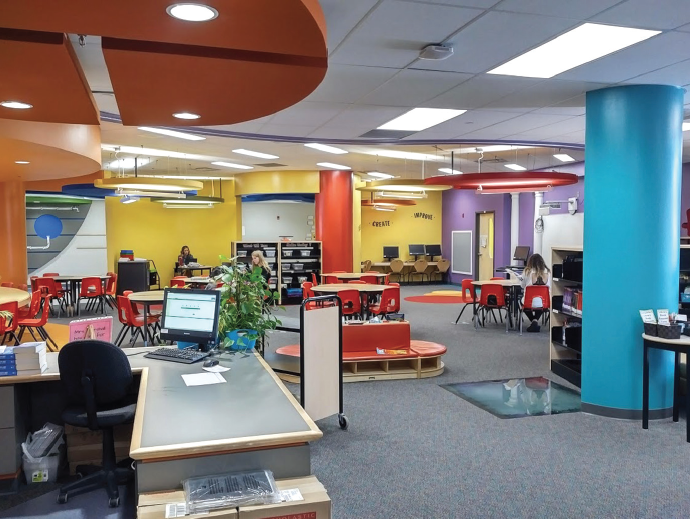 Instead of the staid world of the silent library, space is now intended for interactive, collegial and collaborative activities – including communicating and interacting with the outside world through technology. It is not uncommon to find student “Tech Connectors” working at a Genius Bar in the Learning Commons (Tech Connectors are members of a student club who explore learning technologies and help students and staff use them; a Genius Bar is a tech support area where students and staff help each other). Others work on video projects at the green screen station, and others work with robotics in Maker Spaces. And of course, you will also find students reading high-interest books and reading on devices, taking advantage of comfortable seating in a coffee-shop atmosphere – and these students are in grades K-6! 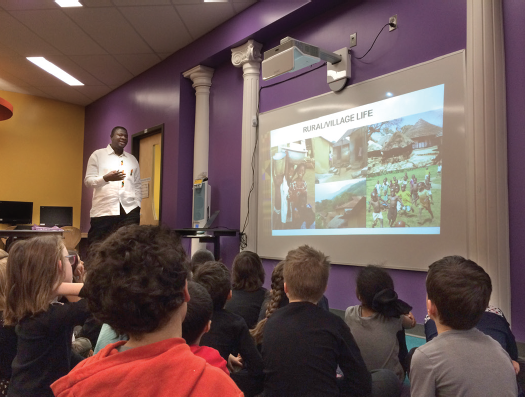 Caves and watering holes: An important contribution from student and staff input and from the literature review was the design of the school hallways. At St. Cecilia, every part of the building is intentionally designed as an opportunity for learning, not just the classroom space. Hallways are differentiated by the use of colour and young students are adept at using colour for navigation as they move around the school. The hallways are designed with “caves and watering holes” – spaces built along the hallways where students can collaborate in small spaces or work independently. These spaces also include access to technology. Comfortable chairs, benches and tables allow for different types of learning activities. Pods: At St. Cecilia, the classrooms are clustered in groups of three and open into a shared central pod area. These pods are extensions of the classrooms, where students from within a grade or across grades can work in collaborative groups. Supervision and observation of the pod is facilitated by large classroom windows overlooking the area. Each of the pod areas includes access to Chromebooks and iPads so that students can access technology whenever and wherever it is needed. Building as teaching structure: Promoting the concept that learning occurs everywhere, not just in a classroom, the school building itself becomes a teaching opportunity. Exposed building systems and elements are intended to create an interactive “museum-like” feature that connects to the curriculum. Engagement is enhanced by the placement of over 20 QR codes throughout the school, explaining how the infrastructure and mechanical systems work. Examples include: a glass wall to showcase the colour-coded mechanical system, a glass-covered cut-out of a wall that shows how the under-floor terrain is constructed to support the floor, a glass-covered floor space to showcase the building foundation and column supports. A time capsule was placed by the students into the flooring at the time of construction. In other areas, drainage pipes from washrooms are displayed, as is the seismic reinforcement (for earthquake resistance). For budding architects and history buffs, classic Greek pillars are used to frame an area in the Learning Commons. Environmental focus: The Ottawa Catholic School Board has been the top-performing school board in energy conservation in Ontario for the last three years. This focus on green energy and conservation is visible throughout the district and at St. Cecilia, where a student-led Environmental Club actively pursues conservation initiatives. Conservation, recycling and composting is thriving at St. Cecilia. The school is now at Gold level under the EcoSchool categorization. At the outdoor classroom beside the Learning Commons, parent and community volunteers help to maintain vegetable and herb gardens on school property, while students learn about the natural environment through various components of the science curriculum. The perimeter of the building is used to enhance energy conservation through the use of planted areas where snow is allowed to build up and insulate the facility. The school is also used for a variety of community activities where children and adults benefit from the state-of-the art facilities. To connect the life of the school with the community at large, a ten-foot LED monitor in the glass entrance tower displays all the good things that are happening at St. Cecilia, whether it’s a Pizza Day, celebration of Easter or the fundraising activities of students around social justice issues at home and abroad. Technology truly helps us communicate to the world our message of Peace and Love. The Ontario Ministry of Education has funded two more new schools within our Board since opening St. Cecilia. St. Dominic opened in September 2015, and a third school, St. Benedict, will open in September 2016. 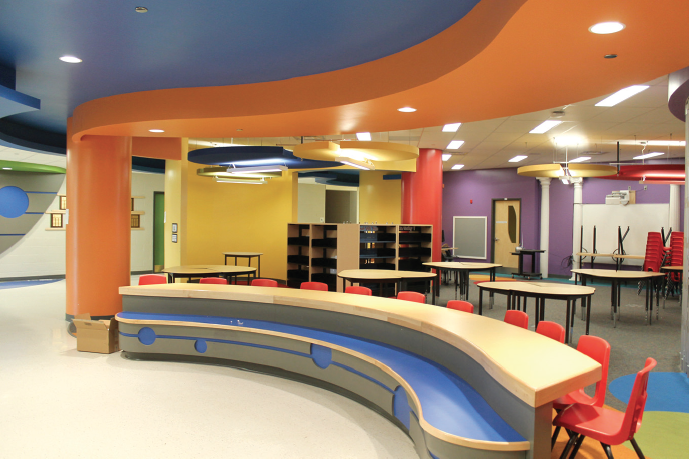 The design of each new school benefits from the feedback of students and staff at predecessor schools. Under an Ontario Hydro initiative at St. Dominic, we were able to incorporate solar panels on the roof of the school. We sell the electricity they generate into the Ontario grid, thereby creating a revenue stream that goes back to classrooms across the district. Some of the other evolutionary changes include enhancements to the functionality of the Learning Commons, increased space for meeting rooms and administrative functions, and universal washrooms. To promote branding and community engagement, the facade and canopy are unique for each school. St. Cecilia’s is not a “one of a kind” dream school with unlimited funding; rather we used pedagogy to lead and drive our vision and design. Our thinking, our planning and ultimately the innovation created, were all incorporated using the same budget and the same overall school size as any of our traditional schools. In September, 2018, we will open another elementary school in the area of Kanata. Our new school Design Committee is once again active as we look at how we can incorporate the principals of deep learning in our next elementary school. We will continue to review the literature, visit other sites, and consult our own staff as we collaborate and innovate to design the best learning environment possible for our students and staff. En Bref: Cet article décrit comment le personnel d’un conseil scolaire a, par la consultation et la recherche, concrétisé une vision de nouveaux espaces d’apprentissage. Le résultat impressionne – une école conçue pour inspirer la collaboration et l’innovation, en reprenant la même superficie et le même budget que les écoles précédentes. Chaque partie du bâtiment de l’école élémentaire St. Cecilia a été intentionnellement conçue pour offrir l’occasion d’apprendre. Les corridors comportent des alcôves et des postes d’apprentissage dotés d’outils technologiques et de mobilier polyvalent. Des systèmes et éléments de construction exposés visent à créer un contexte interactif s’assimilant à un musée qui s’intègre au curriculum. Une salle de classe extérieure favorise l’apprentissage dans un environnement naturel. Tom D’Amico is the Associate Director of Education with responsibilities for the Holy Trinity family of schools. He has served the Ottawa Catholic School Board for 26 years. Simone Oliver is the Superintendent of Early Years Student Success, with responsibilities for the St. Pius X and Immaculata family of schools. She has served the Ottawa Catholic School Board for 33 years. Fred Chrystal is the Superintendent of Planning and Facilities. He has served the Ottawa Catholic School Board for 36 years.